This is your chance to bring your partner! With this retreat you have the chance to invite your partner to join you. Both men and women benefit from a holistic approach to working on a healthy mind in a healthy body and from the healing and energizing capacities of yoga, meditation, healthy food and nature. With this Rewild Yourself retreat you do not only focus on yoga and meditation. You will be in the middle of a 100 square kilometre nature reserve with many activities and experiences centered in nature. You go hiking, mountain biking, swimming. We offer the option to book extra activities such as fishing, foraging or a massage. So bring your partner and Rewild Together. The pictures you often see from yogis are of the extreme. It looks as if yoga is a practice to create the perfect body. The oldest texts with instructions about yoga have been written about 200 years before our time. Yoga is not an objective, it is a tool on your path of personal growth and on your path to rebalance and re-energize your body and your mind. To join this retreat you can be an experienced yogi and we will guide you on how you can deepen your practice. If you have little or even no yoga or meditation experience this is OK too. You only need to have an open mind and a will to surrender to what is awaiting you. And we will introduce you to what yoga, meditation and mindfulness can do for you. Leave behind everything that you are carrying but do not need any more in your life. Take away new insights, learnings and joy for your daily activities in both your personal and professional life. Rewild Yourself and you will go home more aware, with a deeper understanding of yourself. Rewild Yourself and go home revitalized and re-energized with a healthy mind in a healthy body. With 100 square kilometers of wilderness it is a place of nature and a nature conservation project too. The management aims to reforest the reserve, restoring its native species for both flora and fauna. Rich in wildlife you find red and roe deer, the Scottish wildcat, black grouse and golden eagles. The lochs and rivers teem with trout. 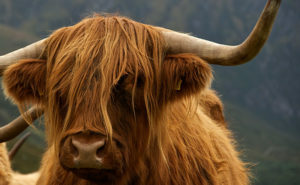 There is also a herd of highland cattle. The reserve is home to a fascinating mix of plant life too, including rare orchids, a broad variety of lichens and even delicious mountain fruits. The main lodge is an impressive Victorian lodge, housing 7 luxurious rooms, a living room, television room, fitness rooms, billiard room. You will feel like a VIP enjoying the views from the comfort of your sofa. Simply gazing out of the windows as the stunning views will never bore you. A more simple and smaller lodge is set against steep dramatic mountain walls. The ground floor has a professional floor heating system and will be totally transformed into a yoga and meditation sala. In the middle of the wilderness you will literally Rewild Yourself and feel at one with nature. Here is also the beautiful dormitory (4 persons max) and two large bedrooms. Food is wholesome, comforting, healthy and delicious. The management prides itself on working with a number of sustainable and eco-friendly local businesses. Seasonally you can even forage your own meal and bring home tasty ingredients such as herbs, plants and mushrooms for dinner. When entering the lodge you can already smell the aromas from the traditional kitchen. Dinner will be served at the elegant dining table in the Victorian lodge. Herbal teas will be served. Coffee and alcoholic beverages are available after the retreat. Nature heals the body as being in nature reduces anger, fear, and stress and increases pleasant feelings. People who spend time in nature have stronger feelings of unity with their communities whether this are neighbors, colleagues, clients or family. Nature inspires feelings of connection to each other and the larger world. People who spend time in nature experience an improvement of their mood; changing from depressed, stressed, and anxious to more calm and balanced. Time in nature is associated with a positive mood, psychological well being, meaningfulness, and vitality. Time in nature increases your ability to pay attention. This provides a break for your overactive mind, recharging your mental batteries, refreshing you for new tasks. A complete internal reset; to take control of your personal and professional life. Rewild Yourself. We look forward to welcome you!